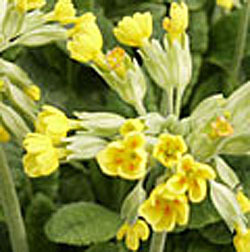 The tight clumps of pebbled leaves have upright stalks of yellow flowers in early spring. Nice for rock gardens and throughout the edges of the perennial border. Also a medicinal herb. height x width 10" x 8"